Congratulations to "Cris", the winner of Alison's giveaway. Thank you to all who participated. Mention the movie Psycho and most people think of the shower scene where Janet Leigh gets sliced into a million pieces. Or they can imagine the spooky house on the hill behind the Bates Motel with the silhouette of a figure in the window. Creepy. It’s even better when it turns out Norman’s mother has been dead for years and his fragile mind has been taken over by her dominant personality. Daphne Du Maurier created a “classic tale of romantic suspense” with the opening lines of Rebecca: “Last night I dreamt I went to Manderley again. It seemed to me I stood by the iron gate leading to the drive, and for a while I could not enter, for the way was barred to me. There was a padlock and a chain upon the gate…” The house becomes another character in this classic tale. In a Hide, Lisa Gardner’s 2008 novel, the villain takes his victims to an underground chamber at an abandoned mental hospital. The setting for a murder doesn’t get better than that. Cable channel TNT did a great job bringing this setting to life. In my latest release, TOO CLOSE TO HOME , I killed a character off in the backyard gardening shed. His family believes he committed suicide. Through the course of the book, the victim’s daughter is haunted every time she looks out the kitchen window and sees the shed. She can’t figure out why her mother doesn’t tear it down. Years after her father’s violent death, the shed has fallen into a state of disrepair. It represents everything the family has lost and their unhealthy decision to try to ignore how the events of that day shaped their lives. The shed’s presence plays a recurring role in the story. I love how my publisher used the shed on the cover of TOO CLOSE TO HOME! I think the artist really captured “the feel” of the story. Before you read the excerpt below, I’d like to hear what some of your favorite settings in romantic suspense novels are. I’m giving away one e-book copy (Kindle or Nook format) of Too Close to Home to one person who comments, selected randomly. The following is an excerpt from Too Close to Home showing how the shed haunts the heroine, Kathryn. And the dream played out the same. The last day of her dad’s life. He had planted his precious garden and filled the boxes adorning the small windows of the yellow shed. Were those the actions of a man about to end his life? A familiar pang of regret and guilt haunted her. Why had she been in a hurry? If she had stopped, spent some time with her father, could she have changed the course of history? She’d lived with that guilt for more than ten years. Ten years of if-onlys and what-ifs. It was enough to put her on edge every time she returned to her hometown. Even in her dream she couldn’t change the course of events. Like an impartial observer, she watched herself dismiss her father to get ready for her big night out. Her heart longed to reach out. Hug him. Tell him she loved him. One last time. She scooped up her tote and shoved the damp towel back in. She looked up. Not a cloud in the clear blue sky. The warm sun beat down on her face that spring day. Her heart was light. Not a care in the world. She grew confused. Her father had never spoken to her in the dream beyond the exchange by the garden. She turned to face him. But he was gone. She crept to the shed, her heart thundering in her rib cage. Her mouth went dry. She had never gone into the shed in her dream. Or in real life. Not after that day. “Stop!” she yelled to her naive, dreaming self. Kathryn swallowed hard as she approached the shed. The image before her changed in the magical way only possible in dreams. The yellow paint had faded. The marigolds in the planters had wilted. Dandelions were the only sign of life. The door stood slightly ajar. She raised a hand and tapped it. It swung open. The open door unveiled a horrid scene. Her father lay in a pool of blood. A scream rose in her throat. But no noise came. A rifle lay by his side. His lifeless eyes stared accusingly. BIO: Alison Stone graduated with a degree in industrial engineering from Georgia Tech. After working in Corporate America for a number of years, she retired to raise her young family. Soon the writing bug bit. After years of conferences, critique groups and writing, Alison achieved her dream of becoming a published author. She claims it was easier to earn her engineering degree. Too Close to Home is her second novel. 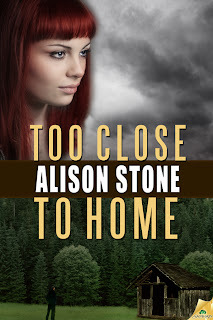 To learn more about Alison Stone please visit www.AlisonStone.com. She’s also chatty on Twitter @Alison_Stone. Warning: Beware of the shadows, disgruntled employees, and childhood crushes all grown up. Giveaway ends 11:59pm EST Aug. 8th. Please supply your email in the post. You may use spaces or full text for security. (ex. jsmith at gmail dot com) If you do not wish to supply your email, or have trouble posting, please email maureen@justromanticsuspense.com with a subject title of JRS GIVEAWAY to be entered in the current giveaway. I'm happy to be visiting Just Romantic Suspense on release day! I'll be popping in and out all day. I can't wait to hear about your favorite settings in romantic suspense novels. Be sure to leave your e-mail address if you want to be entered into the drawing for a free e-copy of Too Close to Home. For me, it depends on the 'type' of RS I'm reading. For those of the Special Ops/military/etc. persuasion, nothing tops a bug-infested jungle crawling with drug runners & tangos in some Godforsaken corner of the world. For the more thriller-ish RSs, nothing's more chilling than the villain's lair. I'm itchy just thinking about the bugs in the jungle ~ great setting. Thanks for stopping by. Evil in "your own backyard" does make for great suspense. Thanks for commenting. The excerpts pulled me in! Great blog! Nice excerpt. I don't have a preference for settings. One of my favorites is a hidden room. Loved the excerpt and cover. Thanks for the giveaway. Oh, a ridden room! Love that! I saw a movie once as a kid where the warped mom hid her kid in a hidden room in her house. It haunted me for years. I forgot about it until now. Thanks, Mary, for taking the time to comment. My suspense romance setting are set in a foreign land where a few natives speak English, hiking in the woods, or right in the big city. Sounds interesting. The communication barrier is built-in conflict. My favorite is a quaint, sleepy town, especially one set along the coast or tucked in the woods. The more docile the setting, the more spine-tingling the suspense seems to be. An abandoned asylum totally creeps me out and makes a great setting, as does an old house with a legend attached. Others I love include ocean liners or a dilapidated hotel. I guess you could say I have a lot of favorites, LOL. Love the cover of your novel. It sounds like a great, spine-tingling read! I'm still haunted by the setting of Salem's Lot. I'm thrilled with the cover, too. Thanks for stopping by! I just re-read "The Haunting of Hill House" by Shirley Jackson & "The House Next Door" by Anne Rivers Siddons & of course their houses were "real" characters. Nice to see you, Janet! Good luck!